An international student at Concordia University says he's lost thousands of dollars to a scam involving bogus cheques — a fake-out that has been widely publicized but caught him unaware. An international student at Concordia University says he's lost thousands of dollars to a scam involving bogus cheques — a ruse that's well-documented but caught him unaware. Abdul Ghaffar, a master's student in electrical engineering from Pakistan, said he was looking for a job on the side to earn a little extra money while studying. His study permit doesn't allow him to work, so scoured Craigslist for jobs that paid cash. "I came up with a job that said 'home general labour,' and basically it said a person needs a guy who can clean his house once or twice in a week, and change the covers and wash the washrooms and that's it," Ghaffar recounted on Saturday. "He said he'll send me money so I can deduct my first week pay — that's $300…. And then he said that he wants me to send money to his travel agent, which is in the Philippines." Ghaffar was told he would receive a cheque, via courier, for $2,550, from which he was to deduct his wages and another $200 to buy his employer groceries. He was instructed to send the balance, using Western Union. to the Philippines. "I said, OK, he'll be sending me money. I'll see if it goes fine, because I know if he is going to send me a cheque, obviously it has to pass through a bank, and if it's not legal it will bounce back," Ghaffar said. 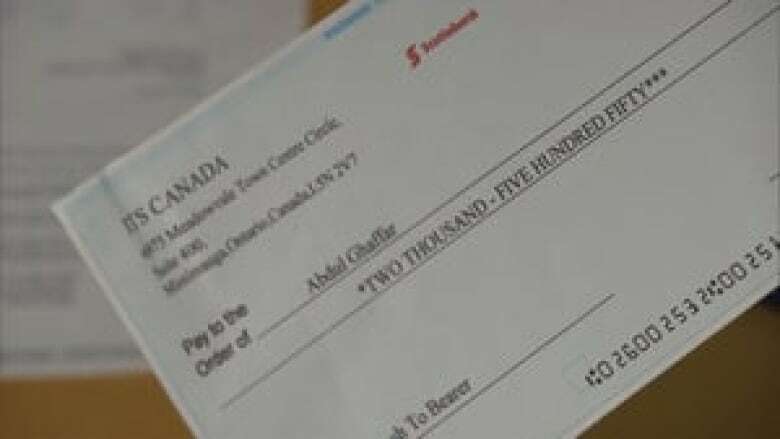 The cheque arrived and Ghaffar deposited it successfully into his account on Oct. 1. He said the bank told it him was all fine and the cheque had cleared. With that, he wired $2,050 to the Philippines. Then another cheque came in the same amount and Ghaffar's supposed employer again asked him to cash it, keep a week's wages and wire the rest to the Philippines. The pretense in this case was that the money was for emergency travel expenses. Ghaffar said he followed the routine two more times with cheques of $2,100 each, from which he kept a total of $200. He asked for but was never told his phoney employer's supposed address, and in two weeks he was never required to do any of the cleaning or shopping for which he had ostensibly been hired. Finally, on Wednesday, Ghaffar tried to access his bank account and discovered it was frozen, he said. "I called the bank and they said that [my] account has been frozen. The bank said, 'You know, the cheque bounced, so they've taken the money out because of the fraudulent cheques and they have frozen the account.' "
Ghaffar checked the Craigslist job posting he had responded to and noticed a warning he hadn't seen before about sending money to strangers via Western Union. "I am new here, I didn't know how things happen here." The phony-cheque scam is, alas, a common one, according to authorities. Canada's Competition Bureau says the general thrust is the same: Someone trying to buy your products or services online will agree to pay your asking price, but then sends a cheque for more than the amount agreed to. They then request that you send the difference back using a money-transfer service. "When it's a complete stranger trusting you with several thousand dollars, that in itself should be a massive red flag that something's wrong with this picture," said Daniel Williams of the Canadian Anti-Fraud Centre, a joint initiative of the RCMP, the Ontario Provincial Police and the Competition Bureau. If it's "too good to be true, it's going to be," Williams added. As it turns out, banks verify very little information on a cheque when it's deposited, especially if it's deposited via an ATM. Because they process thousands or — in some locations — even hundreds of thousands of cheques a day, a bank will accept a cheque just by looking at the amount payable. It's only when the bogus cheque is sent along to a clearing centre and the cheque-writer's account can't be found that the fraud is detected. Williams said the scam has grown in popularity in the last eight or nine years. It's usually run by organized-crime groups, he said, and often originates in West Africa. The fraudsters are hard to catch and prosecute because they run the money they receive through several jurisdictions, he said. That doesn't bode well for Ghaffar getting his money back. Ghaffar says he had $11,000 in his account before he lost thousands to the fraudster. Now he is facing problems paying his tuition fees for next semester, which amount to almost $6,500. His said his family can't afford to give him more funds, either. and he's not sure what he'll do. He added the police haven't been much help, but he's hoping Concordia's international students association will come to his aid.